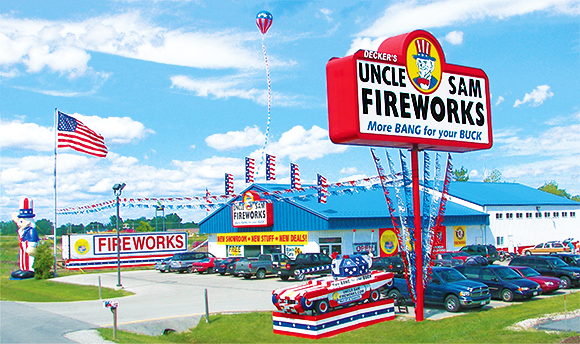 We are a small family business that sells fireworks for people to have fun, enjoy life, and celebrate America. We are located just north of Green Bay, Wisconsin (in Howard) at Hwy 41 and Lineville Rd (Exit 173) on the frontage road (1690 E Deerfield Ave). Visit the contact page to see a map to our store or to talk to us on the phone or through email. Take a look at the customer testimonials page to hear from a few of the many people we make happy every year. In 1976 Mel Decker started the family business selling sparklers and fountains in local grocery stores in northeast Wisconsin. Soon, his son Chuck joined him. He started out selling fireworks from the back of his station wagon. First, at the end of a driveway in Sturgeon Bay, WI, and later at The Silver Dollar Bar in Suamico, WI. 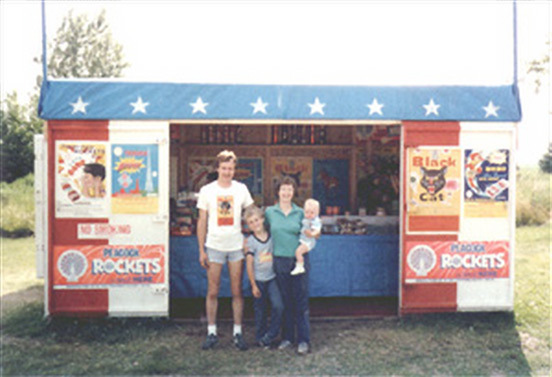 During the 1980's and 90's, Chuck and his wife Deb vended from a small red, white, & blue fireworks stand that they constructed each year in Angelica, WI. It would sow the seeds for the future. In the early 90's, we opened a second location in Abrams, WI, selling out of a trailer by the HiWay Restaurant. That became our primary location for a number of years. In 1998 Chuck felt determined enough to stick his neck out and take a big leap of faith. He decided to make a major investment with everything he had and put it all on the line. All to construct a new mega fireworks store in our home town of Howard (Green Bay suburb). To make it all happen, he found the right location with good visibility, applied for loans and constructed the building from the vision in his head. That summer we had our brand new store. We wanted to have the best store around and we did it. Thanks to the support of many, many people, we stayed in business and were a success. For that we are very grateful to our loyal customers. At that time we had three stores. The little stand in Angelica, the trailer in Abrams, and the new building in Howard. Unfortunately though, the Angelica and Abrams stores didn't survive the effects of the new highway bypass construction. The silver lining however is that we now devote all of our energy to the ever improving mega store in Howard (Green Bay). We've worked hard and paid our dues in order to share our passion for pyrotechnics. We stay involved in the industry, working in Madison to defend the legal use of fireworks. 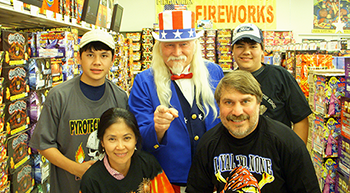 Years ago, Mel Decker played a role in founding the Wisconsin Fireworks Association (WFA) to protect people's rights to use fireworks in Wisconsin. Today Chuck and Deb Decker are both on the board of directors. The Fireworks Alliance (TFA), The Fireworks Foundation, the National Fireworks Association (NFA), and Pyrotechnics International (PI) are other groups we belong to with the goal of insuring people's rights to legally use fireworks nation-wide. We also work to maintain business relations with the best suppliers of the best products. We travel the country (and sometimes even the world) to visit product demos, see what's new every year, and choose from only the best of the best to fill our store shelves. We belong to various fireworks guilds and Chuck regularly serves on the Safety Team during shoots. 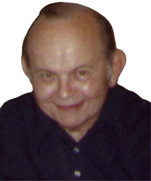 For many years Chuck served on the board of directors for the Wisconsin Pyrotechnics Arts Guild (WPAG). Members of the WPAG come together to basically have fun blowing stuff up. They've won year after year of fireworks competitions held by the Pyrotechnics Guild International (PGI), which is the largest organization made up of professional and hobbyist pyrotechnicians. Locals might remember the PGI from when they recently held a big show in Kaukauna. Our WPAG/PGI trophies are now proudly on display in our store. Mel Decker has passed away, but his son Chuck, Chuck's wife Deb, and their sons Brock and Keith still run the show; with the help of family and friends. Our cousins, aunts, uncles, nieces, and nephews all help out. The man who dresses up as a real live "Uncle Sam" is the actual uncle of Brock and Keith. Even grandma still helps out by baking cookies for customers. 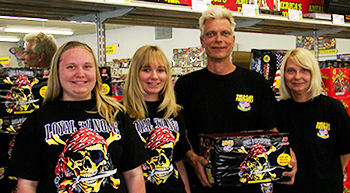 Today, the Decker family tradition of fireworks lives on after three generations. We bring to our customers friendly, knowledable assistance in choosing from the best product selection around. We stay competitive with our prices and strive for excellence in everything that we do. We specialize in customer service and in knowing our product. Come to us this 4th of July and see why you should become one of our many loyal customers. "Get More BANG for your BUCK!"